One of the great joys of traveling around the country speaking about genealogical topics is having that hour, here and there, to take a look at the vast resources and records that exist tucked away in quiet corners of libraries and repositories all over America. Resources and records that often have the answers to our most persistent and puzzling family mysteries. Resources and records that can fill the gaps left by courthouse fires and family losses. Resources and records that aren’t — and, in our lifetimes, likely won’t be — online. 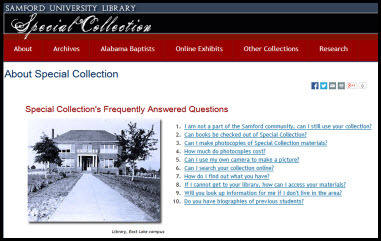 Case in point: the Special Collection Department at the Samford University Library in Birmingham, Alabama. The Legal Genealogist was there this past weekend speaking to the Alabama Genealogical Society, and through the luck of the draw and the good offices of AGS President Yvonne Shelton Crumpler, I had the chance to spend a couple of hours in the library after my flight got in on Friday. Samford is a small private university with about 4,500 total students, graduate and undergraduate. Founded in 1841 as Howard College, it’s affiliated with the Alabama Baptist Convention and has one of the prettiest campuses you’d ever want to see. Genealogists know it as the home of the Institute of Genealogy and Historical Research (IGHR) — the annual week-long program in June that is summer camp for grown-ups with courses ranging from beginning genealogy all the way up to advanced methodology. And tucked into the basement of Samford’s library is the Special Collection. And what that means is an amazing array of records and materials. Resources that are not duplicated even in some of the premier research institutions of the nation. An example: the Library of Congress’ Chronicling America site has four digitized newspapers that cover early Alabama, and only one of them — the Daily Rebel — was actually published in Alabama — and it really wasn’t an Alabama newspaper at all. It was a Chattanooga newspaper whose publisher fled to Alabama one step ahead of the Yankee troops during the Civil War. The newspaper collection at Samford? Dozens and dozens of daily, weekly, even monthly publications from every corner of the state. The county where my people lived in the 1840s through the 1880s — Cherokee County, Alabama — suffered devastating courthouse fires in 1882 and 1895.2 But perhaps some of my answers may be in the pages of the Coosa River News, which began publication in 1878 — a newspaper held in Special Collection. • Oct. 1844; Lebanon Baptist Church, Cherokee Co., Ala.
• Sept. 1845 ; Mount Pleasant Baptist Church, St. Clair Co., Ala.
• Sept. 1846 ; Antioch Baptist Church, DeKalb Co., Ala.
• Sept. 1847 ; Yellow Creek Baptist Church, Cherokee Co., Ala.
And those are just the first few. There are church histories, and county histories, and copies of state census records, and Freedman’s Bureau records, and so many collections of private papers, including one I can’t wait to spend some time with — the papers of Maud McLure Kelly, Alabama’s first woman lawyer. The collection is open to the public, five days a week. Research assistance is available, for a small fee, though the library doesn’t have the staff to do in-depth research for patrons. But if you know the collection has something you need, you can make a research request using an online form. As wonderful as the Special Collection at Samford is, it’s important to note that Samford’s efforts to preserve local history are not unique. There are collections like this all over the United States, indeed all over the world. University libraries. Local historical societies. Genealogical societies. Public libraries. Local, county and state archives. Every one of them has materials that are unavailable anywhere else — that are utterly unique to that one location — that won’t be online any time soon. There’s not enough money, not enough manpower, to get every single item digitized and put online. The only way to do thorough research into our families is by getting off the beaten track, out of our computer chairs, off the internet — to get out to these wonderful special collections and see what records they may hold. It is a good place to start, Samantha! Yeah, so many ancestors, so little time 🙂 Interesting about Madison, though! Funny, out of all of the Bairds, he’s the one whose name I keep feeling may be a clue. Only it’s his middle name – Hiram – that I’ve been clinging to. Never thought about “Madison”! OTOH, I hadn’t come across any other Madisons yet, either.